If you are a follower you know that a roast chicken dinner is at the top of my favourite list. Probably my most often repeated meal. It is one of those easy dinners that I can prepare even on a work night. Even a small chicken will provide enough drippings to make lots of gravy. 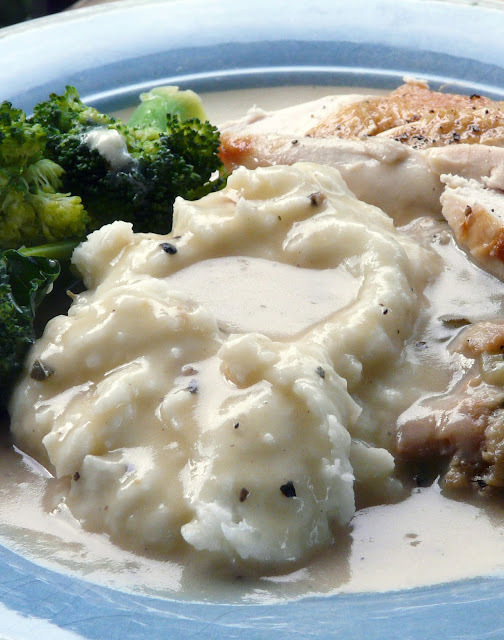 And what better side with a roast chicken or turkey dinner than mashed potatoes and gravy. 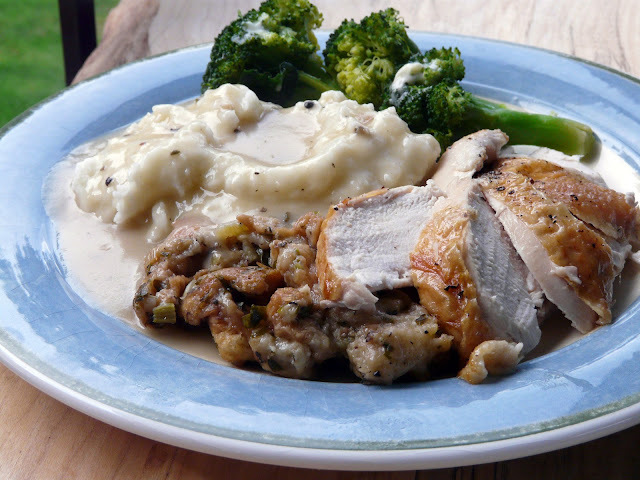 The stuffing/dressing also doesn't take long to put together and only needs 45 minutes in a 350°F oven. I had cut up the bread into cubes the night before so that saved on time. I have enough gravy left that I think I will roast another small chicken tonight and make Hot Chicken Sandwiches with homemade fries. "Diner" food. Pure and wonderful comfort at the highest level. I wish I could crawl through this screen and join you. YUM! I never tire of seeing your chicken dinner Ann! 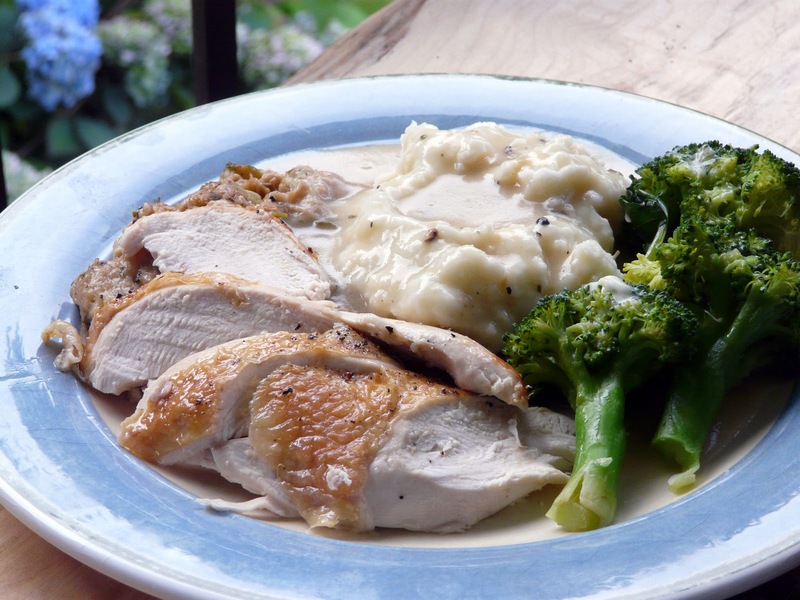 It is raining and yucky here and i have been working all day...i would love to sit down to this plate right now! OMG!! I say that alot!! I just LOVE hot chicken sandwiches... I think that is going to be on the menu for Sunday night supper. 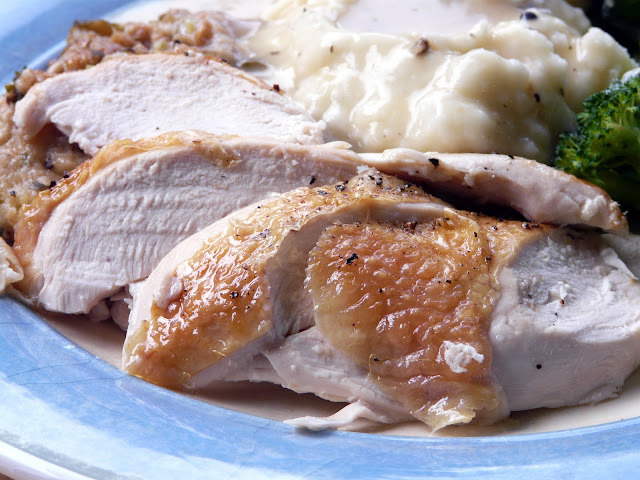 Roast chicken, gravy and mashed potatoes, I don't think it can get any better that this.